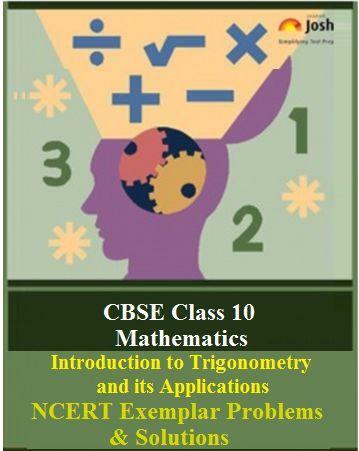 Get here the CBSE Class 10 Maths chapter 8, Introduction to Trigonometry and its Applications: NCERT Exemplar Problems and Solutions (Part-IVA). In this part you will get solutions to Q. No. 1-6 of exercise 8.4 of NCERT Exemplar for Mathematics chapter 8. All these questions are very important to prepare for CBSE Class 10 Maths Exam 2017-2018. Here you get the CBSE Class 10 Mathematics chapter 8, Introduction to Trigonometry and its Applications: NCERT Exemplar Problems and Solutions (Part-IVA). This part includes solutions of Question Number 1 to 6 from Exercise 8.4 of NCERT Exemplar Problems for Class 10 Mathematics Chapter: Introduction to Trigonometry and its Applications. This exercise comprises only the Long Answer Type Questions framed from various important topics in the chapter. Each question is provided with a detailed solution. Question. 3 The angle of elevation of the top of a tower from certain point is 30°. If the observer moves 20m towards the tower, the angle of elevation of the top increases by 15°. Find the height of the tower. Let AC be the h metre high tower and B be the initial point from where angle of elevation of the top of tower is observed. Let after moving 20m towards tower, observer stands on point D with angle of elevation being 30o +15o = 45o and x metres away from the foot of tower. Question. 5 If sinθ + 2cosθ = 1, then prove that 2 sinθ - cosθ = 2. Let AC be the h metre high tower and θ and (90° – θ) be the angles of elevation for distances s and t respectively.